Just a short post today, to share what I spent too much of yesterday doing. You may recall a previous post wherein I was struggling to represent all the different emotional models I’d been reading about in my literature review. A presentation I’m writing for a conference in a couple of weeks gave me the opportunity to have another go, and (importantly for me) make it look a good deal prettier. By about 11.30 last night, I felt that at last I was getting somewhere. So this post simply shares my work in progress, in the picture above. The central donut represents Panskepp’s work, then moving out from that Lazarro’s adaptation of Ekman, Sylvester’s “triggers”, and then floating around the outside, the motovational affordancies listed by Hamari et al. It’s not “finished”. I want to return to Lazarro’s work and reassess that, because I found myself editing out a lot of her emotional responses when I was putting this together. 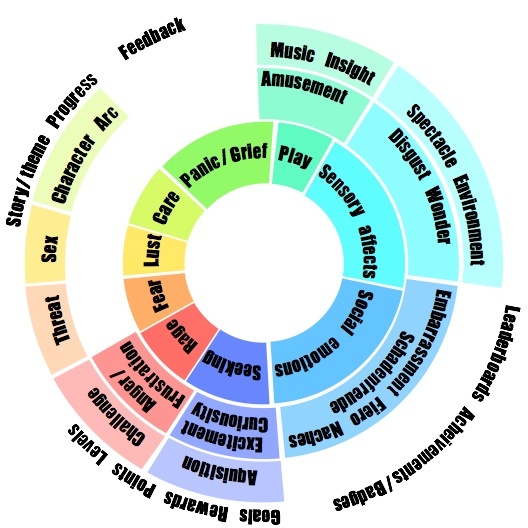 I’m also painfully aware that a trigger like “Music” may elicit all sorts of emotional responses, and it sits possibly uncomfortably linked to Panskepp’s PLAY core emotion (though I justified my decision by saying to myself that surely that music IS play). Now I better get back to my to-do list.